Zip On Tpu - Lightweight Jacketing - Wire And Cable Bundling - Products - ZT | Zippertubing Co.
0.4375" 0.5" 0.625" 0.75" 0.875" 1.0" 1.125" 1.25" 1.375" 1.5" 1.625" 1.75" 1.875" 2.0" 2.125" 2.25" 2.375" 2.5" 2.625" 2.75" 2.875" 3.0" 3.125" 3.25" 3.375" 3.5" 3.625" 3.75" 3.875" 4.0" 4.5" 6.0"
Protect your cables or wires by bundling them with Zip-On® (TPU). Zip-On ® (TPU) combined with EZ-Track® (TPU) is a light-to medium-duty thermoplastic polyurethane (TPU) extruded pressure-track system engineered for applications in which halogen-free, flame-retardant white cable or wire bundling and protection sleeving is a necessity. Add two EZ-Track® (TPU) single extrusions together for a new diameter of up to 0.875". Zip-On® (TPU) is not specifically manufactured using a clean room in sterile conditions, but with the right procedures, it could be used in the medical field, including in hospitals, operating rooms, trauma centers, and emergency rooms. This product has excellent abrasion properties, a track pull force of 15 LBF (min) and is resistant to many oils, chemicals, and greases. The arrowhead-and-channel interlock design closure of EZ-Track® will protect your cable bundle from fluid, dust, and debris. Zippertubing® offers two different versions of Zip-On® (TPU) with EZ-Track® (TPU). Looking for EMI shielding? Zippertubing® currently offers two different types of fully halogen-free EMI shielding that can be integrated with this product. 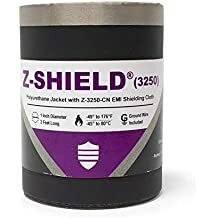 These two EMI shielding solutions include our SHX mesh, which is a good shielding solution, while our Z-7200-C cloth is a better EMI shielding solution. If your application demands EMI shielding, please let us know when filling out your quote. EZ-Track® as a single extrusion comes standard with an SL-EZ slider tool, and for longer runs over 50 feet, check out Zipptertubing's ZTEZ-SP plier tool. 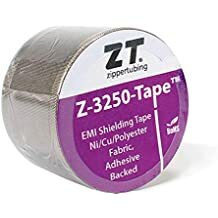 Some Zippertubing® products (including EZ-Track® TPU) may experience roll memory or curling when removed from their spool and prepared for install. This is normal for flexible polymer extruded tracks and jacketing, especially if they are kept in storage for an extended amount of time. If the material curl is making the installation difficult, gently apply heat (with a hair dryer or equivalent) to soften the material and allow for more flexibility and easier handling. *Other jacketing sizes and lengths are available; please reach out to our sales team for alternative options. Cable Diameter 0.4375" 0.5" 0.625" 0.75" 0.875" 1.0" 1.125" 1.25" 1.375" 1.5" 1.625" 1.75" 1.875" 2.0" 2.125" 2.25" 2.375" 2.5" 2.625" 2.75" 2.875" 3.0" 3.125" 3.25" 3.375" 3.5" 3.625" 3.75" 3.875" 4.0" 4.5" 6.0"
The first version is made of Thermoplastic Polyurethane (TPU) that is available in a standard color of white, but can be pigmented to other colors. The second version of EZ-Track® is made of Polyvinyl Chloride (PVC) and is only available in black. Either of these products can be used as a single extrusion, be added to one another for a new diameter, or for an even larger diameter, by upgrading the product and adhere one of Zippertubing's jacketing materials together. Some Zippertubing products (including EZ-Track® TPU) may experience roll memory or curling when removed from their spool and readied for install. This is normal for flexible polymer extruded tracks and jacketing, especially if they are kept in storage for an extended amount of time. If the material curl is making the installation difficult, gently apply heat (with a hair dryer or equivalent) to soften the material and allow for more flexibility and easier handling.